NO MIDDLE MEN SO WE CAN PASS THE SAVING ON TO OUR CUSTOMERS. QUALITY PRODUCTS AT SENSIBLE PRICES. All our products are CE / ISO9001:2000 / ROHS / accredited. And manufactured by a member of the Water Quality Association. ALL OUR PRODUCTS ARE UK STOCK. 50 US GALL PER DAY 5 STAGE REVERSE OSMOSIS SYSTEM WITH 80PSI BOOSTER PUMP. This High Quality System Incorporates a Flow Restrictor Bypass Valve for Manual Flushing of the R O Membrane. This Ensures the System is Always Performing at its Best. This Superb System Produces up to 190 Litres per day of Purified Water and Comes with 3 us gallon storage tank, Installation Manual, Chrome Faucet Tap and all Pipes, Pre Filters, Post Filters, and Fittings Required for easy Installation. Purified Drinking Water for the home , Purified Water for your Aquarium. All our 10 filter housings have the superior double o rings fitted for a better seal. 5 Stages of Filtration Are. A Micron Sediment Filter Made of 100% Pure Polypropylene Fibres. Removes Dirt, Sand and Rust. A Granular Activated Carbon Filter Composed of High - Performance Activated Carbon. Removes Free Chlorine, Odour, Organic Contaminants, Pesticides and Chemicals. A Carbon Block Filter Composed of High Performance Carbon. Removes Trihalomethanes, Pesticides, Volatile Organic Chemicals and 99.95% of Giardia and Cryptosporidium Cysts. A High Rejection Thin Film Composite Reverse Osmosis Membrane with the Capacity to Produce up to 190 Litres of Purified Water per day. This Membrane Removes Contaminants Present in Water Including, up to 99% of Dissolved Salts, Lead, Copper, Barium, Bacterial By-Products, Oestrogen and Silica. A Post Carbon Filter Designed to Improve Taste. It Removes any Residual Impurities and Odours from the Tank and Provides a Finer Conditioning of the Purified Water. 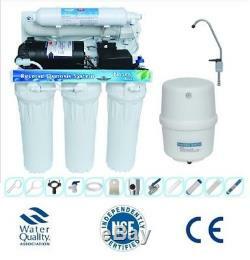 The input water must meet the following criteria for proper Reverse Osmosis function: < >. Temperature must be less than 45 degrees Celsius. Iron content no more than 0.1 ppm. Water pressure must be a mimimum of 40 psi To acheive maximum water production you would require the optimum 80 psi of water pressure. PH not less than 3 and not more than 11. TDS under 1000 ppm recommended. The item "Domestic Reverse Osmosis water purification filter system Fluoride Removal" is in sale since Tuesday, September 19, 2017. This item is in the category "Home, Furniture & DIY\Appliances\Small Kitchen Appliances\Water Purification\Water Filters". The seller is "collinswaterproducts" and is located in s26 6qp. This item can be shipped to United Kingdom, Austria, Belgium, Bulgaria, Croatia, Cyprus, Czech republic, Denmark, Estonia, Finland, France, Germany, Greece, Hungary, Ireland, Italy, Latvia, Lithuania, Luxembourg, Malta, Netherlands, Poland, Portugal, Romania, Slovakia, Slovenia, Spain, Sweden, Australia, United States, Canada, Brazil, Japan, New Zealand, China, Israel, Hong Kong, Norway, Indonesia, Malaysia, Mexico, Singapore, South Korea, Switzerland, Taiwan, Thailand, Chile.